Each year Aisling goes to Blessington in Co. Wicklow for the week of St. Patrick’s Day. This year 16 returning men and four support workers made the trip. Alex McDonnell reports on the ups and downs of "coming home". Anne Saunders runs the Lakeshore holiday village in Blessington. Last year when we were staying there she showed us the new development which was still being built along the edge of the lake. She was full of enthusiasm for the project which would include restaurants and water sports and other leisure facilities. She told us that if we came back next year we would be among the first into the new houses. Usually we book travel and accommodation through Irish Ferries as it is a good bit cheaper but this year we are boycotting the company since the shenanigans last December (see: The East and the West) and I booked five cottages over the internet and the travel with Stenaline ferries.We are used to the luxury of the Ullyses, Irish Ferries’ flagship but the Adventurer, Stenaline’s boat out of Holyhead is pretty good too. By the time we arrived at Holyhead a couple of the lads were pretty worse for wear and it turned out they’d brought a bottle of whiskey with them and had gotten (un)steadily paralytic in the darkened bus as we drove through the night to North Wales. When we got onto the ferry Steve had to be virtually carried out of the bus into his wheelchair, his arms and legs going everywhere but where they should, like Daniel Day Lewis in My Left Foot. Steve’s mother had came to see him a couple of weeks before at Arlington House. He’d told her that he didn’t want her visiting him there but she was in London visiting another of her sons and she turned up one Saturday at 5pm when Steve was in bed after a big drinking session. He told the staff member to go away in no uncertain terms when he brought the message that his mother was in reception to see him. 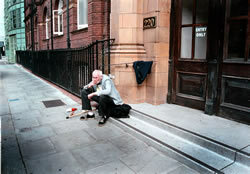 He was coming on the trip but there were no guarantees that he would see her in Dublin. Steve and Frank were like two naughty schoolboys on the journey to Dublin. By the time I woke up in my cabin and came down to the lounge every one was looking a bit sore after a rough night. The sea had been a bit choppy but nothing like as bad as the forecast said it would. 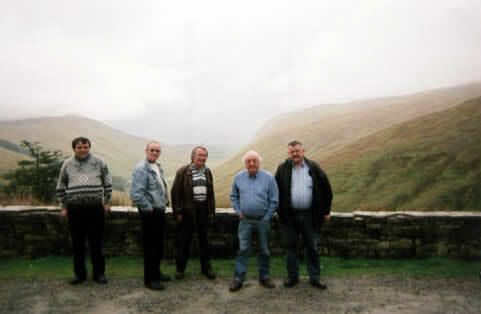 I found out the reason was the awful behaviour of the boys who were threatened with £3,000 fines and worse for their refusal to obey the smoking ban and their drunken and loutish behaviour made it a stormy crossing for the other 14 returnees and the two support workers left to keep an eye on them. Myself and John as the only two drivers needed to rest in our cabin before we could drive to Wicklow at the other end. Charlie was worn out trying to keep a bit of order and her relationship with Steve and Frank was severely strained. We arrived in Dublin docks at 6.30am but we couldn’t book into our accommodation until 9.00am so we took our time getting to Blessington hoping to find somewhere for breakfast on the way. Our friend Niamh Collins couldn’t make breakfast for us as she was in Cuba studying their health service. No luck there but we did a bit of shopping so we could get cooking as soon as we were in the cottages. Except that these weren’t really cottages, more like executive style houses on an exclusive estate. I found Paul in the swanky new reception area and he gave me the keys and showed me around the first house. They were pretty much identically smart and plush, not the sort of accommodation we expected, or wanted for that matter. We were the first guests here and the houses were a blank canvas. For instance, the floors were covered with a light coloured carpet. Any stains would be ours and ours only. Paul went straight back to reception after showing me around and then we unloaded the minibuses and got everyone sorted into their houses – the usual pairing up along friendship lines, and keeping the drinkers away from the non-drinkers as much as possible. We had several men with us recovering from years of problem drinking and the exhibition Frank and Steve put on the night before had shook them up. You can tell the recovering drinkers because they are always unusually clean and well presented. This morning they looked relieved and a little shocked. You could see they were relieved they weren’t making exhibitions of themselves but also shocked to see the behaviour that they could have been guilty of in former times. I took the house that Paul had shown me on the edge of a lawn sloping down to the lake with great views, as had the other houses which had been designed with the intention of making the most of the natural advantages. I gave Anne a ring to tell her we had arrived and to congratulate her on her new development. Anne sounded glad to hear from me but didn’t know what I was talking about, until it dawned on her that we had booked into the new development. She and the developers had gone their separate ways some time into the project and it seemed that they were now rivals. Whoops! I promised that we would stay in her own cottages next year. So… the new owners knew nothing about Aisling and now they had a load of problem drinkers and street people as the first guests in their executive style country club development. For the next couple of days I could see Paul looking around corners at the group as we came and went and a security guard appeared patrolling the houses, after dark. He was from Lithuania and passed his twenty-second birthday watching our lads smoking cigarettes on the steps of their posh homes for the week. Steve and Frank calmed down after the madness of the journey. And they too went onto the porch outside the front door or out on the terrace at the back of the house to have their frequent fags. Everybody kept to this rule without having to be told and the houses were kept clean throughout the week. Frank took to his bed for the first couple of days and had to be persuaded to drink the cans of cider we had brought to keep the withdrawals at bay. Shortly after, he was up and about, feeling good and got stuck into cooking and cleaning for the week. Peter as usual spent most of the week cleaning and eating. Sometimes we get worried about Peter because he seems to eat so much but never puts on any weight, in fact he seems to thinner than ever. Especially worrying, when you consider that he is wearing up to three shirts and two pairs of trousers at any given time. Peter will be up at six in the morning cleaning the minibuses, he’ll have two bowls of cornflakes to start the day and he’ll go around the five houses checking to see if any work needs to be done and on the way he’ll have at least two full Irish breakfasts.